During last few years, a lot of positive reports and studies were published showing Ethiopia becoming a major clothing or apparel source for the EU and US importers. In 2014, one Bangladeshi corporate body, the DBL Group, expressed interest to invest in Ethiopia. In 2016 it announced that with an investment of US dollar 100 million, a composite knit factory in Ethiopia will start functioning from February 2017. DBL is supported by Swedish RMG buyer H&M with a US$ 15 million soft loan from Swedish government agency and by Ethiopian Development Agency with a US$ 55 million loan. The rationale for DBL to invest in Ethiopia is the country's duty-free access to the USA market under AGOA and the EU market under GSP for LDCs. Although Bangladesh enjoys similar market access to the EU, it doesn't get that in the USA. 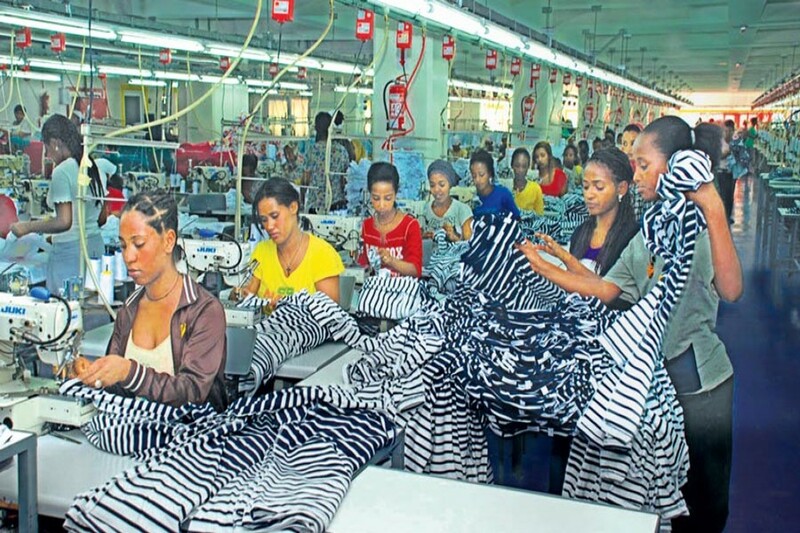 It has also been reported that many other countries, including China and India, were keen to invest in textile and clothing industry in Ethiopia and forecast of FDI surge in that country became regular features in global media. The Ethiopian delegations are also seen visiting many countries seeking FDI in recent years. However, the political disturbance associated with violence and tribal clashes in last couple of years followed by the imposition of State of Emergency in the country dampened the spirit of the potential foreign investors. Notwithstanding the political instability and internecine tribal clashes, there is serious doubt if Ethiopia can actually be a major competitor for Bangladesh's RMG export even with generous FDI and duty-free access to the USA market. Ethiopia, the oldest independent country with the second largest population in Africa, has 90% of its maritime trade channeled through bordering port of Djibouti. It has still short of skilled manpower as seen from DBL's decision to employ 150 Bangladeshi executives for its proposed factory. Djibouti also has unique distinction of hosting several foreign military bases in its territory. Djibouti is bordered by Eritrea in the north, Ethiopia in the west and south as well as Somalia in the southeast -- all volatile with militant activities tribal and Islamists origin. Considering the strategic importance of Djibouti as main sea link in the Horn of Africa, USA, France (German and Spanish military presence is hosted by the French), Italy, Japan and China installed bases there. Even Saudi Arabia and UAE are considering their own bases in Djibouti to deter Iranian influence in that region. The main exports of Ethiopia are coffee, tea and spices (31.6 per cent), oil seeds (22.2 per cent), live trees, plants, cut flowers (10.9 per cent). The total export in 2016 was valued at US$ 2.4 billion. This was up by 45.9 per cent since 2009 when the great recession set in, but was down by 53 per cent from 2015 to 2016. With very insignificant export of woven RMG, Ethiopia's total export of knit clothing in the same period had been US$ 71 million (3 per cent of the total export). This export of knit had the fastest growth among top 10 export items, up 3,868 per cent over the seven-year period starting in 2009. Based on 2015 data, $2.1 billion or 41.8 per cent of Ethiopian exports by value were delivered to Asian countries while 28.4 per cent were sold to European nations. Ethiopia shipped another 23.2 per cent worth of goods to African importers and 5.9 per cent to the USA. The RMG export to USA and EU is dominated by the knit items worth $ 13 million and 30 million euro respectively. The total Ethiopian exports to the EU in 2016 were 711 million euro and to the USA about $ 320 million. In the same period, Bangladesh exported about 15 billion euro worth of clothing to the EU and to the USA the value of apparel export was about US$ 5 billion. Ethiopia, in recent years, attracted FDI in several of its economic sectors of which textile and clothing (T&C) takes a prominent position. Ethiopia is a cotton-growing country for a long time. But its cotton has traditionally been used for handicraft industry to weave cloth. With a development plan for cotton undertaken by the government in last 4 decades, Ethiopia can now supply cotton to its textile mills and export some surplus. This factor, among others like availability of huge land in the Economic Parks with infrastructural facilities, duty-free market access to the USA and the EU markets together with lucrative fiscal incentives, attracted the Chinese and the Indians to rush to Ethiopia for investment in the textile and clothing. Ethiopia is basically an agrarian economy and that reflected in the dominance of agro-products as the main export items. However, the government set a target to diversify its export linking with its cotton production. In last few years, the textile and clothing industry has grown at an average of 51 per cent and more than 65 international textile investment projects have been licenced for foreign investors during this period. The country offers several positive factors for FDI in the T&C. But one market study done by Alliance experts mentioned some major constraints or challenges the potential investors will face in T&C sector. It particularly raises the inefficiency in factories which is as slow as 40-45 per cent in production both in textile and garments assembly units. Alliance also pointed out the challenges related to the cycle time and delivery. Cycle time can extend up to 150 days due to the lack of available raw materials as 60 per cent of that are imported. It is clear that Ethiopia is still far from Bangladesh to become a competitor in the RMG export market. The possibility of trade diversion with negative impact on Bangladesh is very unlikely even on a long term period. However, RMG investment from Bangladesh to Ethiopia is another issue which may be determined by factors beyond simple investment rationale. With existing economic infrastructure and human resources, no LDC is likely to make any dent in the Bangladesh's market share in RMG export. Duty-free market access to the EU and the USA is not enough to divert trade from Bangladesh. Bangladesh has established its firm position as an efficient and competitive supplier of bulk RMG products behind only China in those criteria. Even today Ethiopia is facing ethnic strife with associated violence. The region is also facing interstate conflict on territorial claims. Economically dependent on a foreign port, it has also low technology base, lack of skilled labour and shortage of English-speaking human resources. The initial euphoria of FDI surge in this promising country has already been diluted with reports of attack on foreign-owned business establishments by anti-government forces. Political instability prevailing in the country, among other factors, remained the single most important impediment for Ethiopia to become a major source of RMG import. Zillul Hye Razi is a former Trade Adviser, European Union (EU) Delegation to Bangladesh.